Imagine mixture of jazz Bird’s Parkers Mood and John Coltrane’s Alabama playing the piano in a succession of jazz combos and hip hop’s Golden Age of Public Enemy, Boogie Down Productions to the Detroit-techno euphoria of Inner City. Magnus Zingmark and Oscar Simonsson, both from Sweden’s main university-town Uppsala, were the first jazzheads in their hometown (late 90’s – Sons of Koop, 1997 ) responsible for the groundbreaking music – under the name Koop. They brought new sound for Swedish jazz (Waltz for Koop, 2001) and gained the recognition of fellow European jazz/electronica fusion. 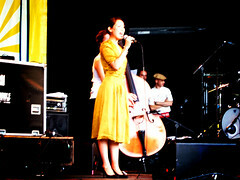 Waltz for Koop brought out in daylight two great female vocalists, Cecilia Stalin and amazing Yukimi Nagano. After 2003., Koop published remixes that included singles for “Summer Sun”, “Bright Nights,” “In the Heartbeat” (feat. Terry Callier), Koop released this winter pleasure – Koop Islands Blues. Enjoy listening Koop Island Blues feat.Ane Brun.